JICE Hokkaido Office concluded a cooperation agreement of five years with Tokai University Sapporo Campus, which is located in the south of Sapporo, to promote an international exchange. In accordance with this agreement, Hokkaido Office supports students’ internship in foreign countries, promotes acceptance of foreign students from Asian countries and provides local information, and offers lectures featuring international cooperation. Currently, the majority of exchange students in Tokai University Sapporo Campus is from Northern Europe such as Finland and Norway, but the university hopes to increase foreign students from Asian countries whose economy is continuing to grow. JICE can offer local information of Asia through local offices in the area. 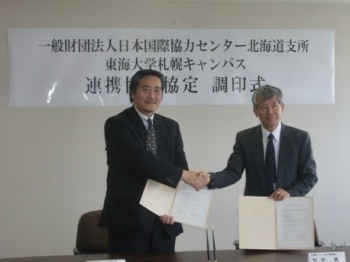 This is the third agreement with universities in Hokkaido after Hokkaido University of Education in 2004, and Obihiro University of Agriculture and Veterinary Medicine in 2010. We are very pleased to contribute to development of young generation in cooperation with higher education utilizing our know-how of human resource development in developing countries.